Supply-Side grounded and bonding conductors are sized from Table 250.102(C)(1) in the 2014 NEC. In earlier Codes, all these conductors, as well as the Grounding Electrode Conductor, were selected from Table 250.66. Table 250.102(C)(1) from the 2014 NEC. It is very helpful to have a separate Table for selecting the size of the Grounded Conductor, Main Bonding Jumper, System Bonding Jumper, and Supply-Side Bonding Jumper. These conductors are installed to carry fault current and return it to the electrical source. The Grounding Electrode Conductor, on the other hand, is not intended to carry fault current. Its job is to connect the grounded conductor and equipment to the grounding electrode. According to an Informational Note in 250.102: The term supply conductors includes ungrounded conductors that do not have overcurrent protection on their supply side and terminate at service equipment or the first disconnecting means of a separately derived system. 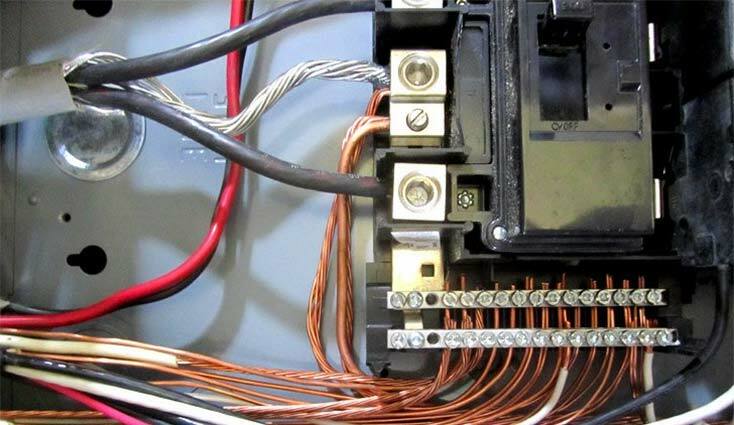 The Grounded Conductor, Main Bonding Jumper, System Bonding Jumper, and Supply-Side Bonding Jumper are critical to the safe operation of the electrical system. They are the vital link back to the electrical supply that will cause the overcurrent device to trip and clear a fault. The bigger the service, or the larger the transformer on a separately derived system, the bigger a fault can be, and the bonding jumpers must be large enough to handle any fault that is possible on the system. The Grounded Conductor, Main Bonding Jumper, System Bonding Jumper, and Supply-Side Bonding Jumper are selected based on the size of the ungrounded conductors at the service or the source of a separately derived system. As the size of the ungrounded conductors increases, so does the size of the bonding jumpers. Conductors: grounded conductor, system bonding jumper, and grounding electrode conductor. An important difference between using Table 250.102(C)(1) for selecting the right size Bonding Jumpers, and Table 250.66 for selecting the right size for the Grounding Electrode Conductor, is that a Grounding Electrode Conductor never has to be larger than 3/0 AWG. No matter how big the service or separately derived system gets, the Grounding Electrode Conductor never has to be larger than 3/0 AWG. You would think that for services where the ungrounded conductors were larger than 1100 kcmil the corresponding size of the Grounding Electrode Conductor would have to increase. But it doesn’t. Because the Grounding Electrode Conductor is not expected to carry fault current, 3/0 AWG is the largest it ever has to be. Not so with the conductors that are sized from Table 250.102(C)(1). For services or separately derived systems where the ungrounded conductors are larger than 1100 kcmil, the Grounded Conductor, Main Bonding Jumper, System Bonding Jumper, and Supply-Side Bonding Jumper have to increase in size in proportion to the size of the ungrounded conductor. Note 1 to Table 250.120(C)(1) says that for ungrounded phase conductors larger than 1100 kcmil copper or 1750 aluminum the size of conductors selected from the Table must have an area not less than 12 ½ percent of the area of the largest ungrounded supply conductor or the equivalent area for paralleled supply conductors. For example, the equivalent area of four ungrounded, paralleled 500 kcmil conductors is 2000 kcmil. 12 ½ percent of 2000 kcmil is 250 kcmil. For a service that uses four paralleled 500 kcmil conductors per phase, the minimum size main bonding jumper is 250 kcmil. Summary: Table 250.102(C)(1) is used to select the Grounded Conductor, Main Bonding Jumper, System Bonding Jumper and Supply-Side Bonding Jumper, based on the size of the largest ungrounded phase conductor. These bonding jumpers are intended to carry fault current. The size of the selected bonding conductors increase as the size of the ungrounded phase conductors increases, no matter how large the ungrounded conductors are. Table 250.66 is used to select the size of the Grounding Electrode Conductor. It is not intended to carry fault current and never has to be larger than 3/0 AWG. To learn more about grounding, sign up for courses online at https://www.jadelearning.com. I have been dealing with David for the past 8 years. I use Jade Learning for all my electricians at our Orange County Utilities pumping section when they need to renew their CEU’s. The reason I like the course, is that you have to READ the NEC code book and THINK rather than just attending some boring 14 hour course and the only thing you do, is listen to the instructor and then at the end of the day, get your 14 hour CEU certificate. This site is professionally designed and keeps your interest throughout the course. I get many offers for other CEU courses, but Jade Learning meets all my expectations, so I don’t need to look any further. Thanks and congratulations David on another great CEU course. When you look in the index of the 2017 NEC, under Conductors, then Grounded, there is no reference to 250.102(C)(1). How would you find this table if someone else didn’t tell you to reference it? You are on the right track by focusing on a key word or term such as grounded conductor. When you look up Conductors, then Grounded you will find the first reference given is Alternating current systems, 250.24, 250.26. Scanning through 250.24 I see 250.24(C) Grounded Conductor Brought to Service Equipment and immediately below in (C)(1) is a reference to 250.102(C)(1) for sizing the grounded conductor. Table 250.102(C)(1) was added in the 2014 NEC and unfortunately not everything that is added makes it to the index. There are 3 important tables that you will use repeatedly in Article 250. Table 250.66 for sizing grounding electrode conductors, Table 250.102(C) for sizing grounded conductors, main bonding jumpers, supply side bonding jumpers, and system bonding jumpers, and Table 250.122 for sizing equipment grounding conductors. I ran into a 2500A Service with 6 parallel 500mcm Conductors on each phase. Only 3 – 500mcm Neutrals (Grounded Conductors). Is this correct? According to the 12.5% rule it seems the grounded conductors (neutrals) could have been as small as 3- 400mcm conductors. Correct? Calculating the required area of a neutral-conductor serving an electrical service, by figuring that “area” at 12.5 % of the largest area of the ungrounded (hot) service conductors, is correct. But only to the extent that the required calculation, that was necessary in the beginning of the project to determine the service size needed for this facility, yielded no more than that 12.5% for a neutral. The 12.5% in the NEC is a default number for when the service is essentially balanced between phases, to the point where it requires very little “neutral capacity” to carry the unbalanced load. When the service calculation (that factors in the actual imposed loads on that service) does determine that very little neutral is required, then the NEC does dictate no less than 12.5% of the area of the hot conductor (ungrounded conductor), so that loads later added to the service, if they require a neutral, will have one at their disposal. Very often this required calculation at the beginning of the project, reveals the need for a neutral larger than 12.5% of the ungrounded conductor. That, I feel certain, is what you were witnessing at the installation you described.